Defending UFL Cup Champions, Air Force FC bowed down to Kaya FC in their opening match of the United Football League Cup. Kaya FC struck early and dominated the flow of the match en route to a 1-0 victory over Philippine Air Force FC Phoenix Saturday in the opening match of the United Football League at the Rizal Memorial Football Stadium. Ivorian forward Eric Dagroh opened the scoring for Kaya, which finished fourth in the season’s Cup competition last December, barely four minutes into the match. A few moments later, Dagroh appeared to have scored a second goal, which was disallowed because of a foul on Kaya inside the penalty box. Kaya surprisingly dominated possession of the match, as the Airmen seemed a step slow. Wave after wave of Kaya attacks kept coming in the first half, and only the steady goalkeeping of Air Force FC veteran Tats Mercado kept his team in the match. Things did not get better for Air Force FC in the second half, after elite forward Nate Burkey and Joshua Beloya checked in for Kaya. Burkey and Beloya, along with Dagroh, kept hooking up for opportunity after opportunity, with Mercado barely foiling them each time. Beloya, the architect of the Philippine Under-23 football team’s miracle comeback against Laos in the Southeast Asian Games last November, acquitted himself well in his league debut, showcasing great skill and instincts. Air Force FC, on the other hand, looked visibly frustrated in the match, with Philippine national team stars Chieffy Caligdong and Ian Araneta getting emotional on the pitch. The Azkals stalwarts were shackled by the Kaya defense which controlled the middle of the field for most of the match, leaving Air Force FC to try to attack from the flanks. Air Force FC had still had a great chance for the equalizer late in the match when Caligdong set up for a penalty kick on the left side just outside the box. His bending kick looked like it was about to go in, but a timely header by Jason Sabio saved the goal for Kaya. A follow-up header by Yanti Barsales, the Golden Ball winner in the Cup competition, went wide. The result seemed like deja vu for Air Force FC, which suffered only one defeat in last season’s league competition — a 1-0 loss to Kaya. Offense won Philippine Air Force Phoenix games, but it was defense that won the Airmen the UFL Cup Title. 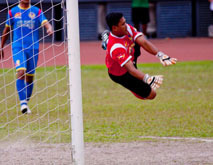 Air Force relied on a huge defensive effort anchored by goalkeeper Tats Mercado — and more than a little luck — to keep the sheets clean against the most dangerous offensive team in the tournament, en route to a 2-nil win over the Loyola Meralco Sparks in the championship match of the 2011 UFL Cup Saturday at the Rizal Memorial Football Stadium. 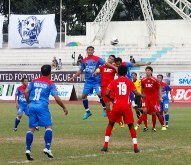 The victory bolstered Air Force’s claim as the king of Philippine club football before a banner crowd of 6,000 fans. The defending league champions, the Airmen also avenged their championship loss in last year’s Cup finals to Global FC. It did so by shutting out a vaunted Loyola offense that did not score less than two goals all tournament long. The Sparks controlled the ball for most of the first half, with Air Force finding the occasional shot at goal. Despite Loyola’s dominance, veteran Azkals striker Ian Araneta opened the scoring for Air Force in the 38th minute with a left-footed goal after fan favorite Chieffy Caligdong broke through the Sparks’ midfield coverage. Loyola came out with renewed vigor in the second half. At the 52nd minute, James Younghusband headed in what looked like the game-tying goal for Loyola after a Mark Hartmann free kick, but the score was disallowed after the referee ruled that the latter had prematurely made his kick. Loyola kept on the attack, but its shots were repulsed by Air Force led by Mercado, who did everything from saving goals, directing the Air Force defense, and even jawing with Loyola star Phil Younghusband. At the 84th minute, Loyola looked like it would finally put one on board after Mercado made a rare mistake after a Hartmann free kick, but Alexander Elnar’s attempt hit the crossbar. While Loyola was trying to go for the equalizer, Air Force capitalized in the 90th minute, as a defensive breakdown by the Sparks allowed ageless veteran Yanti Barsales to score against an out of position goalkeeper Ref Cuarema to seal the championship. It was a rough and tumble game that saw a total of nine yellow cards — five for Loyola and four for Air Force. Several scuffles involving teammates with the Philippine national team added color to the game. The battle lines were clear prior to the match, as the two teams represented different sides of Philippine football. Air Force, composed wholly of homegrown players, have long ruled the Philippine club football scene, while Loyola, led by popular foreign-born Filipinos the Younghusbands, are coming off a very strong offseason build-up. After the match, Mercado admitted that having an all-homegrown lineup was a point of pride for his club. In the day’s earlier game, Global defeated Kaya to grab the third place trophy. 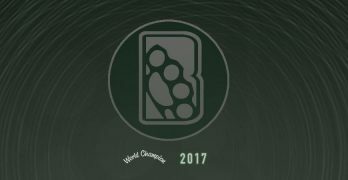 The two finalists also dominated the individual awards, with Barsales winning the Golden Ball award — the Cup’s equivalent of the most valuable player award. Mercado brought home the Golden Gloves award as the best goalkeeper in the tournament while Phil Younghusband won the tournament’s Golden Boot award for leading the competition in scoring with 25 goals. Barsales also took home the Healthway Agility award. Air Force FC turned on the jets in the second half for two goals that put away Green Archers United for a 3-1 win in last Sunday’s quarterfinals match up in the 2011 UFL Cup. Following a first half marked by spotty officiating, it was the Green Archers who immediately took the fight to Air Force with some high pressure. But the Airmen broke through one of the competition’s steadiest defense lines in the 35th minute when striker Yanti Barsales headed in a corner shot by Chieffy Caligdong. Prior to Barsales’ score, Green Archers had two opportunities to put the Air Force side, coached by Sgt. Edzel Bracamonte, on their heels, but Arnie Pasinabo and Tating Pasilan missed two shots on goal including one where all the former had to do was send it through with Air Force keeper Ed Mercado lying helpless on the ground after blocking a first shot by Archers’ midfielder Agbayomi Oloweyeye. In the 28th minute, Green Archers’ defender Arjay Soliman fired a long range shot that had Mercado backing up. The Air Force keeper’s full extension allowed him to bat away the ball despite pressure from Nikko Villa who rushed forward. In the 64th minute of the second half, Air Force stepped up their bombing runs. Defender Jalor Soriano pounced on an errant back pass by Soliman that he parlayed into a cross from the right side of the box. The ball was stopped by an Archers defender but Airman Jeruzel Tonog booted in the ball before keeper Martin Villaflor could collect it to put Air Force up, 2-nil. Ian Araneta added a goal in the 69th minute this time from the left wing but he was carded for excessive celebration when he pulled up his jersey. Green Archers salvaged back some pride when Reynald Villareal converted a penalty following a Mercado foul on Pasilan inside the Air Force box. The Adolfo Alicante-coached alumni team of La Salle found confidence in their goal but the referee blew the whistle on full time a few minutes later. Air Force moves on to face nemesis Global FC in the semifinals.